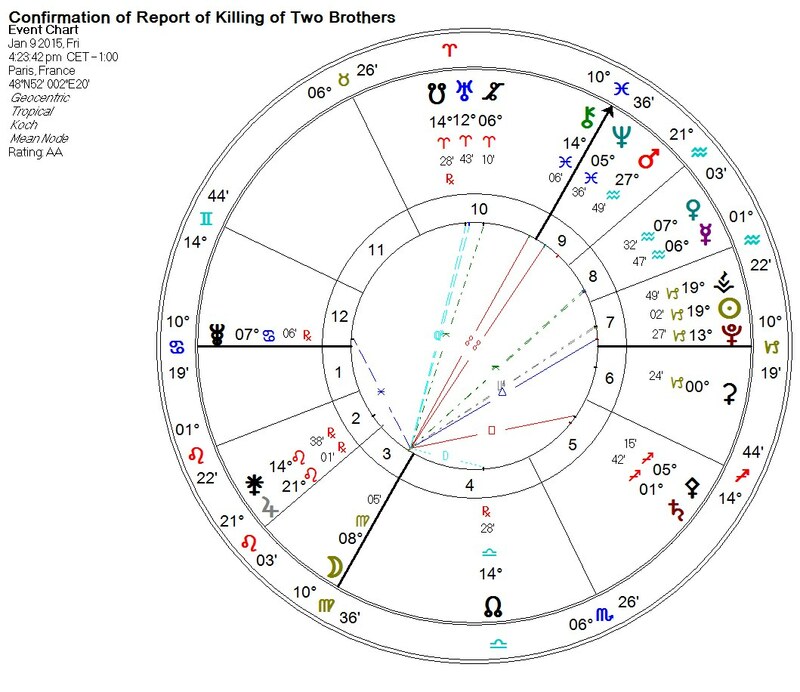 We cast this chart “live” as the confirmation of the death of the Kouachi brothers in the Paris hostage situation was reported by CNBC. 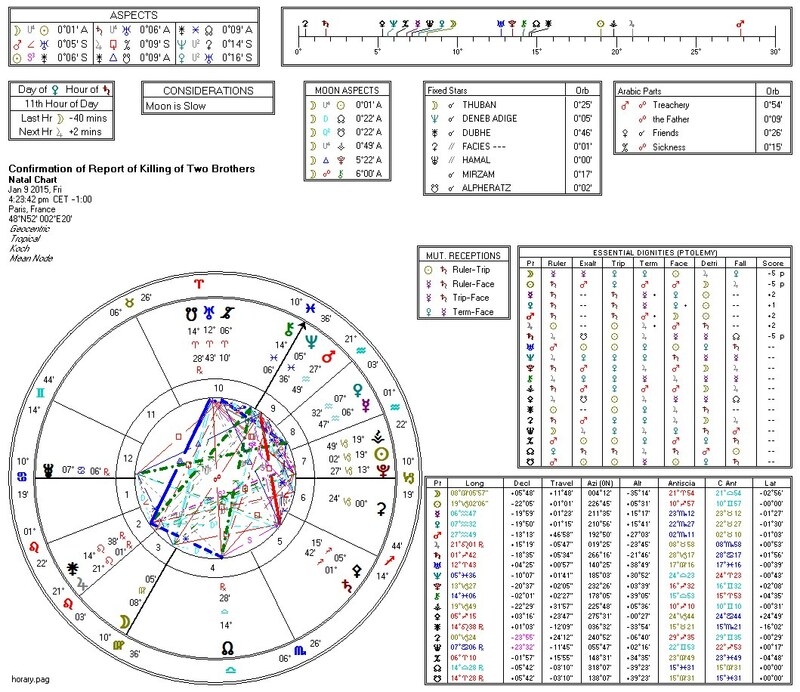 We note that the Moon opposition to Chiron / Neptune is active during this process, with Moon having set slightly before the report, Neptune having just risen, and Chiron rising. Just in report: death of the hostage taker at the supermarket (just barely past the rising of Chiron). In the immediately preceding post to this one, we mentioned the importance of this particular Moon opposition to Chiron / Neptune on this date. 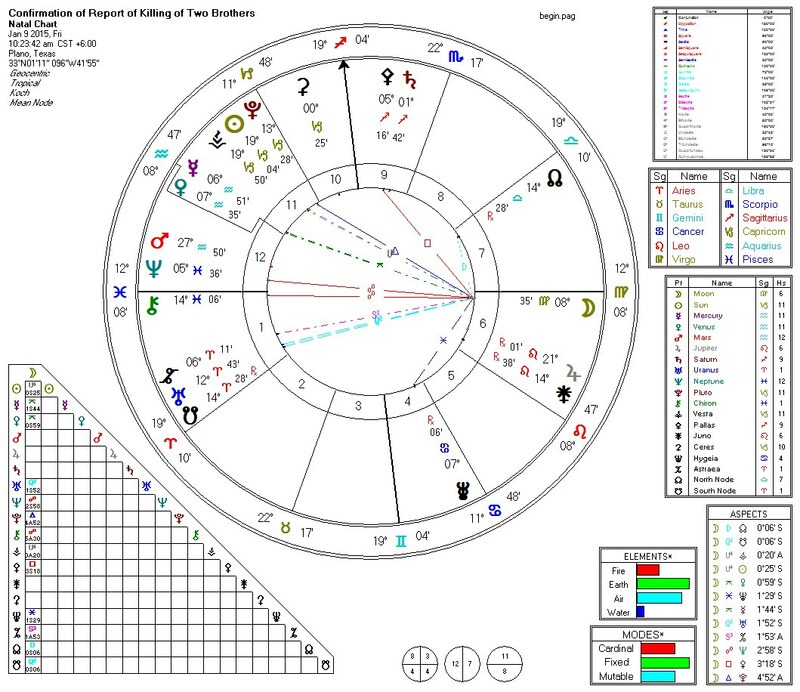 Do not think for a moment this is “over.” Based on the other patterns (Hele, Focused Yod) on this date, we expect continued polarization (Hele) to occur and a potential for more violence (focused yod) to be in play. If this chart (an hour earlier?) was really the turning point, here is what we read. (1) Again, the “femme” (Hayat Boumediene) is the key. (2) She heavily influenced the brothers but not as much the man in the grocery store (even though he is described as her “husband”). 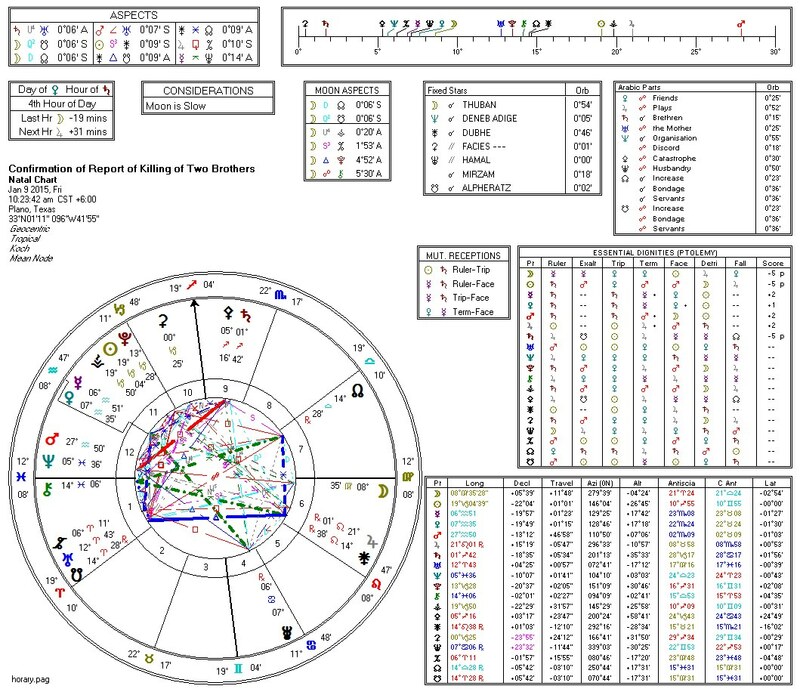 In one chart, the earlier chart, Mars (almost certainly Amedy Coulibaly) was in opposition to the “Part of Treachery.” In the other chart, the later (official) chart, Moon is conjunct (aligned with) the “Part of Treachery.” Was the death of her “husband” her ticket out of an arranged “marriage” that had failed? Mercury and Venus (8th house) likely represent the dead hostages. Seventh house shows three more (as yet undiscovered) co-conspirators, at least one of whom is a particularly sinister figure (Pluto). One of the three (as yet undiscovered) co-conspirators may be some kind of religious figure or “traditional” female (Vesta). The Plutonic figure may actually be a member of an intelligence community and could have been an agent provocateur. If so, they will never be found and no official admission of their existence will ever occur. 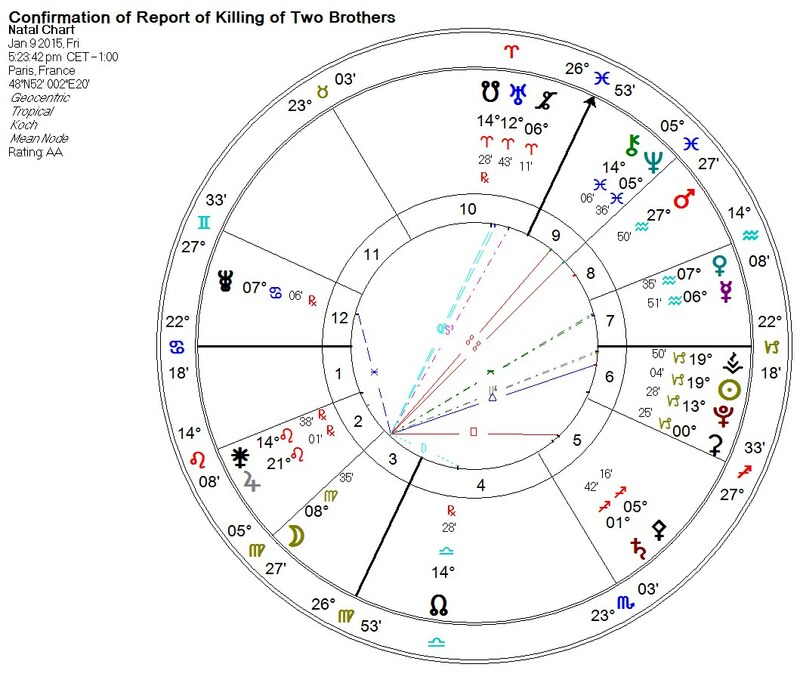 Finally, these two brothers (Neptune and Chiron) simply could not achieve anything meaningful in life, and the horrible acts they committed as they competed for the attention of the woman (Moon) and this horrible death was the “best” they could achieve (Midheaven). Astro-Databank has a chart for the massacre at the Charlie Hebedo magazine offices. Keep your eyes and ears open. We are in dangerous times. Reblogged this on Jude’s Threshold. Need to convert from Central Time? Astro bits, 14th Sept, 2017! Astro bits, 13th Sept, 2017! Weekly Tarot 13/09/2017. Speak Your Truth! 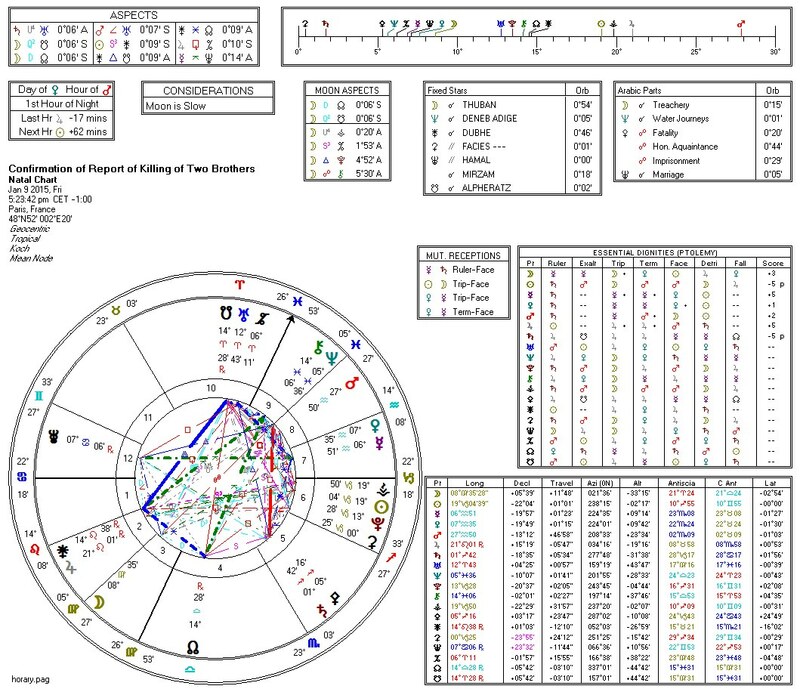 Planetary Aspects and Transits Displays aspects between planets at a given date, personal transits and synastry. It has graphical and dynamical displays as well as tabular. It identifies aspect patterns and enables searches for them, and graphs planets transiting natal planets. September 23 Prophecy: Signs on the Mayan Calendar? Dreams that changed my life. Frankenstein: The Most Misread Novel?